40 Years After Secret U.S. War in Laos Ended, Millions of Unexploded Bomblets Keep Killing Laotians | Democracy Now! bomb accident survivor and victim assistance advocate in Laos. leads an all-women bomb clearance team in Laos. founder and executive director and founder of Legacies of War. Forty years ago, on March 29, 1973, the “secret” U.S. bombing that devastated Laos came to an end. By that point, the United States had dropped at least two million tons of bombs on Laos. That is the equivalent of one planeload every eight minutes, 24 hours a day, for nine years — more than on Germany and Japan during World War II. The deadly legacy of the Vietnam War lives on today in the form of unexploded cluster bombs. Experts estimate Laos is littered with as many as 80 million “bombies” — or baseball-size bombs found inside cluster bombs. Since the bombing stopped four decades ago, as many as 20,000 people have been injured or killed as a result. To mark International Day of Mine Awareness, we speak to a Laotian bomb survivor and a leader of an all-women bomb clearance team in Laos. Thoummy Silamphan and Manixia Thor are speaking at the United Nations today and are currently in the United States on a tour organized by Legacies of War. It was 40 years ago that the “secret” U.S. bombing that devastated Laos came to an end, March 29, 1973. By that point, the U.S. had dropped at least two million tons of bombs on Laos. That’s the equivalent of one planeload every eight minutes, 24 hours a day, for nine years—more than was dropped on Germany and Japan during World War II. The deadly legacy of the Vietnam War lives on today in the form of unexploded cluster bombs, which had about a 30 percent failure rate when they were dropped from American planes over large swaths of Laos. Experts estimate that Laos is littered with as many as 80 million “bombies,” or bomblets—baseball-sized bombs found inside cluster bombs. Well, since the bombing stopped four decades ago, as many as 20,000 people have been injured or killed as a result. This is the focus of our guests, who have come from Laos to raise awareness about this ongoing problem. Our guests are Thoummy Silamphan, a bomb accident survivor and victim assistance advocate—he was eight years old when a bomb exploded as he was digging in the earth. Manixia Thor is with us. She leads an all-women bomb clearance team in Lao. And Channapha Khamvongsa is the founder and executive director of Legacies of War. We welcome you all to Democracy Now! Thoummy, I’d like to begin with you. Talk about what happened to you. AMY GOODMAN: Eight years old. THOUMMY SILAMPHAN: Yeah, and when I was eight years old, at that time I studied in primary school. So, one day, I needed to find some bamboo shoots for to feed my family, to make soup. So—and when I saw the bamboo shoots, and I tried to dig into bamboo shoots. After that, the bombie explode to me. AMY GOODMAN: What you call a “bombie,” like a bomblet, exploded? AMY GOODMAN: How far up does your prosthetic go of your left hand? THOUMMY SILAMPHAN: I think just over here. AMY GOODMAN: It’s just your hand. THOUMMY SILAMPHAN: Yeah, just my hand, yeah. AMY GOODMAN: How did the bomb explode and destroy your hand? AMY GOODMAN: And again, this is when you were eight years old. AMY GOODMAN: How old are you now? THOUMMY SILAMPHAN: Now I’m 26. AMY GOODMAN: And what kind of use do you have of your hand? THOUMMY SILAMPHAN: I want to say, now I use the prosthetic hand. And it’s very, very difficult for me to help myself. And I just can help type a computer or something like that. AMY GOODMAN: If you could talk, Channapha, about the significance of this tour that you’re beginning? CHANNAPHA KHAMVONGSA: Sure. So this is really the first unprecedented journey by those who are directly impacted by cluster munitions from 40 years ago. So, Thoummy and Manixia really represent the new generation. So, two generations later, people are still being hurt and maimed by these bombies. And Manixia, of course, is, you know, a female deminer. And so, really, this is the first time that voices from Lao, that were unheard from during the bombings, are now speaking about their lives and what they’re living with, what their families are living with and what their communities are living with. And so, we’re incredibly excited not only to talk about, you know, the history, but really the ongoing problems and ways that we can address this so that future generations can live on their land safely. AMY GOODMAN: Can you talk about your own family background? And first, you say Lao or Laos? CHANNAPHA KHAMVONGSA: When I’m in country, I usually say Lao. When I’m around Lao people, they usually say Lao. But here in the U.S. context, it’s usually Laos, the country. AMY GOODMAN: So, talk about your own family. You live now in Washington, D.C.
CHANNAPHA KHAMVONGSA: Yes. I was born in Vientiane and came here when I was quite young. I went through refugee camp. And so, you know, part of—in trying to, I think, sort of learn about the history of why our family came here, of course that history included this dark part of our past, both as Lao and an American. And so, that sort of sense of identity has really led me to further understand the history, but also the ongoing problems of what we can do to bring a safer world to the children and the people of Laos. AMY GOODMAN: Manixia Thor, you lead an all-women bomb clearance team. We’re talking about 80 million unexploded U.S. bombs in Lao soil. What is a clearance team? And what does it mean to be all women? Channapha Khamvongsa is translating. MANIXIA THOR: [translated] So, every day, as an all-female demining team, we go out and we dig and try to find bomblets on land where people live and farm and work. So, she’s just emphasizing the importance of the job and the importance of clearance, because it’s people’s livelihoods and it’s people’s lives. If they don’t work the land, they don’t eat. AMY GOODMAN: How did you choose to do this? This is an incredibly dangerous job. MANIXIA THOR: [translated] It’s very dangerous. I’m afraid. Other people are afraid. And so this work is necessary, because there are so many bomblets, and it’s so dangerous for the people in the country. And so it’s necessary work. AMY GOODMAN: Describe how you find these bombs and how you clear them. MANIXIA THOR: [translated] There’s a metal detector. And if we come across one, we will carefully excavate it, see what kind of bomb it is, and if it’s large, then we will clear it and then detonate it. And so, for little bomblets, the one that you described, the 80 million that they come across, it will be brought, piled together, and then the villagers are cleared, and then they explode them. AMY GOODMAN: Do you wear some kind of protection? MANIXIA THOR: [translated] No, actually. AMY GOODMAN: On Friday, on the 40th anniversary of the ending of the U.S. bombings in Laos, a bomb left over from the nearly decade-long bombing campaign claimed the life of a two-year-old boy and injured five others as they prepared their lunch over a fire. Thoummy, how common is this? 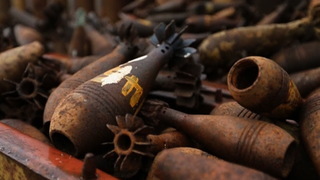 THOUMMY SILAMPHAN: So now, we want to say, as I think we know, as well, the war is ended and stopped many years ago, but now the UXO continue to kill and injure people until now. And that is why we want to involve for the Legacies of War. I think Legacies of War is very, very important for the Lao people, especially for the UXO clearance and for victim assistance in Laos, because now we have more than hundred town the UXO explode in Laos. And now we also have many survivors that are just waiting for support and help. AMY GOODMAN: You have come to the United States. This is some fact and figures from The Guardian newspaper. So far, the U.S. has contributed an average of about $3 million a year to bomb removal efforts in Laos. In contrast, the U.S. spent more than $2 million a day—about $17 million in today’s dollars—for nine years dropping the bombs in the first place. Channapha, if you can talk about the significance of this, what the U.S. is doing now and what you want the United States to do? AMY GOODMAN: I mean, should it even be Laotians who are doing this? Or do you feel the U.S. should be doing this? AMY GOODMAN: They dropped the bombs. CHANNAPHA KHAMVONGSA: Right. I think that we can—we need to do this together. Those on the ground, those that—people like Manixia and Thoummy live with this on a daily basis, and they can help themselves. What we need is international support, support from the U.S., and resources to continue this work, because it’s not going to go away anytime soon. And so, it’s important to build local capacity. But at the same time, more resources are needed. AMY GOODMAN: We’re about a half-hour’s drive from Honeywell’s corporate headquarters. Honeywell is the maker of many of these bombs that are left in the soil of your country. Have you spoken with Honeywell or any of the other bomb makers? CHANNAPHA KHAMVONGSA: We haven’t—we haven’t reached—we haven’t gone through that route. We know that there are many people from that era and that generation that were involved with either the bombings, the production of—and who never would have thought that, 40 years later, what they were involved in, whether it was the bombing, whether it was the production of these bombs, that it would still be killing and maiming people. And so, actually, many of those individuals have joined our effort to make sure that the next generations aren’t impacted by what was done 40 years ago. AMY GOODMAN: Manixia, what were you taught, growing up, about where these bombs came from? MANIXIA THOR: [translated] She heard from her father during the wartime that planes dropped bombs on her—yeah, he actually never identified the country; he just said the bombies came from planes from above. AMY GOODMAN: And so, what is your message here? Why have you come to the United States? MANIXIA THOR: [translated] This is very important. And, yeah, this is an opportunity to tell the American people about what is going on in my country and the problem of UXO. The war might have ended 40 years ago, but for the people of Laos, it really hasn’t. And it’s still very alive for many of us in Lao today. So the hope is that as people hear and understand the problems, that there will be more support, there will be more awareness, and that we will get additional support to do our work. AMY GOODMAN: Have you ever worked with a U.S. bomb clearance team? MANIXIA THOR: [translated] No, because I would do work in Laos, so I haven’t done any work in the U.S.
AMY GOODMAN: But they haven’t come to you to help you clear American bombs from your soil? MANIXIA THOR: [translated] There are a lot of international workers. AMY GOODMAN: Where are they from, generally? MANIXIA THOR: [translated] From Lebanon, mainly. AMY GOODMAN: Channapha, how many people are like Thoummy, have been victims of the exploding bombies or bomblets or bombs, land mines in the ground now? CHANNAPHA KHAMVONGSA: They were cooking around a fireplace. You know, we would go and microwave our food or turn on the stove. In Lao, they cook around a fire. And a little boy found a bombie, brought it into the circle, and it exploded. Of those that were killed or injured, the boy was two years old. The other three were another two-year-old, a three-year-old and a five-year-old. Forty percent of those that are killed or injured are children. AMY GOODMAN: Is there education across Laos, in addition to the bomb clearance teams and efforts, for people not to pick up these bombs? Or how do you avoid inadvertently setting them off? CHANNAPHA KHAMVONGSA: Right, no. The education happens, but they’re so profuse. They’re everywhere. And as you know, children are curious. And these little bomblets look like tennis-size ball toys. And so, they’re very curious. And I would imagine that this two-year-old thought he was picking up something that he could play with. AMY GOODMAN: How many people live in Laos today? CHANNAPHA KHAMVONGSA: About 6.5 million. AMY GOODMAN: 6.5 million. And there are 80 million bomblets, bombs, bombies still in the land in Laos? AMY GOODMAN: That is something—that’s more than 10 per person. CHANNAPHA KHAMVONGSA: The amount of bombs that were dropped equated to about a thousand pounds per person. AMY GOODMAN: Well, I want to thank you all for being with us, Thoummy Silamphan, for joining us from Laos, coming to the United States; Manixia Thor, who leads the all-women bomb clearance team; and Channapha Khamvongsa, who is head of Legacies of War here in the United States.